HWHT is committed to helping individuals achieve their business goals! Helping Women Help Themselves (HWHT) is a private individual offering business advice to individuals that either own and operate a small business or are thinking about owning and operating a small business. Over the past 35 years, Joe McCloskey has been involved in virtually all aspects of running a business. His experience includes Fortune 500 companies as well as small private companies. He has held numerous senior management positions in several companies, including President & CEO of Specialty Foods Group, a $350 million processed meats company, and President of Jif-Pak Manufacturing, a $30 million casing company. 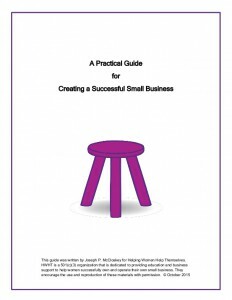 He has written “A Practical Guide for Creating a Successful Small Business” which is available to download on this site at no charge. All business advice is “free of charge.” The only thing Joe asks is that you “pay it forward” in your own community. If you would like to set up a meeting or contact Joe to discuss your business questions, you can email him by using the contact button below. Our practical guide is intended to provide you with the basic business questions that you should consider when owning and operating a business. If you have additional questions or concerns about your business, click here to send your request today! If you need business assistance or would like to set up a one-on-one business consultation session, please fill out the form below to make your request.